It’s the time of year when gardeners are starting to think about their plans for the upcoming season…no matter how cold, snowy, or icy it may be! Our Master Gardeners are no exception, and they worked hard to plan all these different beds in our Demonstration Garden over the past several weeks. This is an overview of our garden layout with the themes for each bed. Both Beds 1 and 4 are split in halves for two different themes this year. Bed 1 will feature Brassicas on one half in the spring and carrots in the fall. The Brussels Sprouts will grow through the season. The other half of this bed will be vegetables that have snack value and interest for children. Bed 2 is our Tomato garden this year. The trellis and half of the cages will feature varieties that are “indigo” types. These have a gene that promotes anthocyanins and a very dark, purple-black color on the shoulders. I’ll guarantee you that the fruit will be unique! 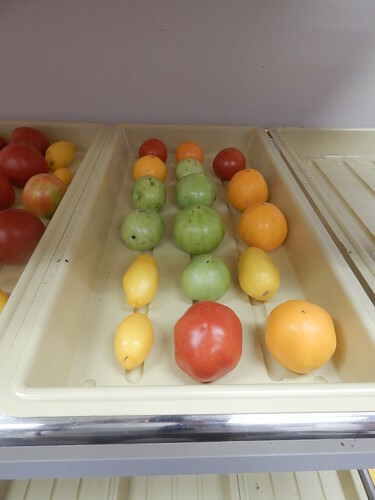 The other three varieties are beefsteak tomatoes (more than 10 oz fruit) that also happen to grow on compact vines. 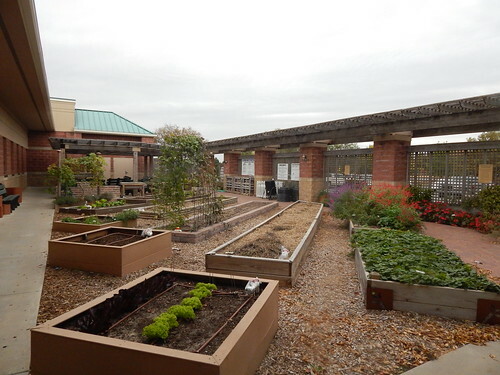 The SNAP-Ed garden in bed 3 is a new project for us in partnership with our nutrition educators. This garden is also divided in half, and each half has a budget of $30 to spend, total. This includes seeds, plants, fertilizers, and any trellising structures or materials. The general plans are as pictured, but specific varieties will be determined based on what is available at retailers that can take SNAP (Vision cards / food assistance) benefits, as those on SNAP can use those dollars to purchase seeds and plants for a food garden. We will also be tracking the methods used, the total yield, and the value / return on investment of each garden half. Bed 4 is also divided into two separate themes. Half will feature heirloom shelling beans (dry beans), with 4 varieties of pole beans on trellises and two varieties of bush beans. The other half will feature Italian vegetables and herbs. Bed 5 is our “Miscellany” garden. In other words, things we wanted to try (or plant again) that didn’t fit into any of the other beds’ themes. The Herbs / Pollinators garden is returning to Bed 6 this year, with some similar things and some new things, including a cascading ornamental oregano and some different types of Agastache. After several years as our Kitchen Herb Garden, Bed 8 will be home to our Edible Flowers garden this year. Did you know that all those flowers are edible? Bed 9 is still the Hops plant for at least one more year. 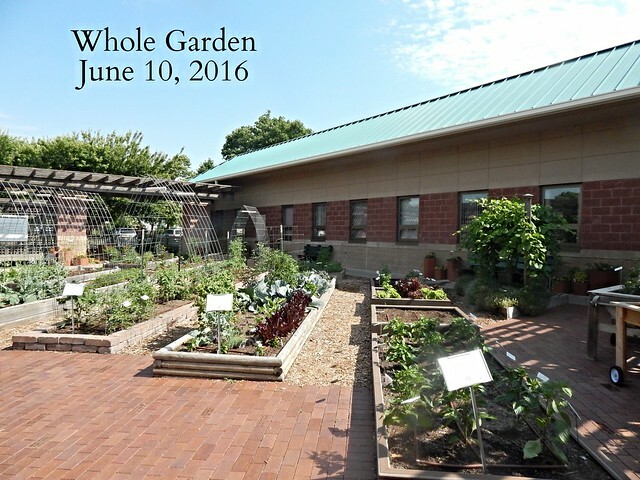 Bed 10 has been designated as the “Year-Round Salads” garden. Featuring lettuce in the early spring, spinach in the late fall, and a mixture of less common, heat tolerant greens in the summer. With orach, amaranth, and goosefoot, it’s going to look a bit like a weed bed to start with! The accessible gardens will reprise some of the plants found in other areas of the garden, but with more confined growing conditions of the planters. The barrel planters will include some greens, herbs, and radishes. Last, but definitely NOT least, the containers on the inside perimeter of our garden will feature a range of peppers. The goal is to start with the sweet peppers on one side of the garden, and gradually increase the Scoville (heat) level around the garden. Not pictured or listed, we will also continue to have gingers in some of the shadier containers, as well as herbs. We will be showcasing a wide range of rosemary in one set of containers, including varieties that we can only grow as annuals. Outside the garden, the annual flower demonstrations will continue in the large containers. There you have it, our complete vegetable garden plans for 2018! As always, we have some exciting, new, and different things planned for the year. We will be starting seeds this week for some of the earliest plantings. It’s been almost a month since the last harvest report, but that doesn’t mean we haven’t been harvesting. We had a stunningly beautiful harvest this past week, with gold beets, purple carrots, green beans, and more! I’m not going to break this down by week, just lump everything all together. The lettuce and arugula are now pretty much done for the first part of the year, while we have just been pulling the biggest beets and carrots. The onions will probably be ready in a couple more weeks, and the beans are just getting started. I also expect to see ripe tomatoes by next week. With a week of warm temperatures and no rain, everything is growing quickly. The end of the spring crops is almost here and the summer veggies are starting to set fruit! It’s hard to see from this overview photo, but I know that in a few weeks the tomatoes are going to be most of the way up the trellises and the garden will look completely different yet again. We did remove one of the quilt block lettuce gardens, since the lettuce was bolting. The other is holding on for a little longer. 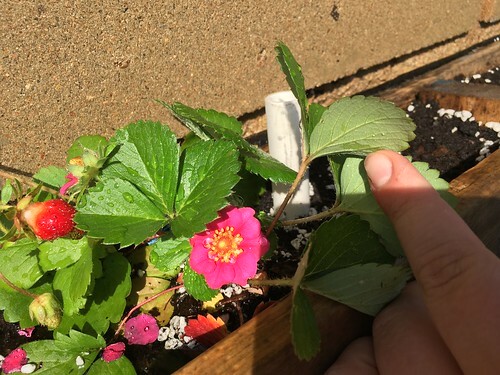 The ‘Rainbow Treasure’ strawberry on top of the pallet is blooming a bit and fruiting. The plant is still very small, but the colors are great. Let’s just say that watering the pallet garden is every bit as challenging as I expected it would be. We have the PVC tubes, but they don’t get the edges watered. 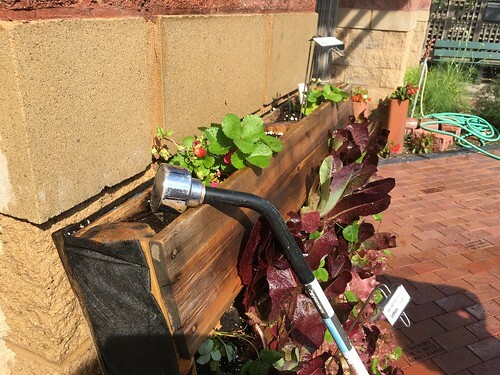 We ended up putting the watering wand on the upper corner at a slow trickle to soak in. Still not ideal. 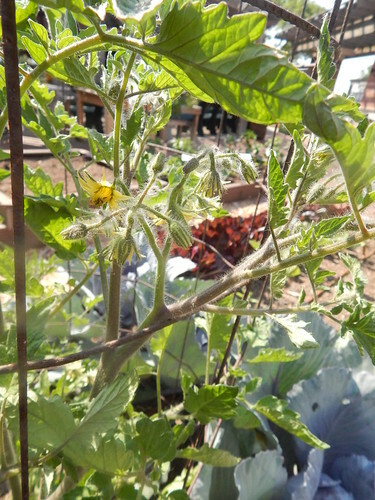 I keep trying and trying to capture a picture of the ‘Black Beauty’ tomato plant, because the stems have a purple cast to them that is striking and in contrast to the other plants. But with the sunlight, I can’t get it to show up the same way in a picture. You’ll have to come see it! 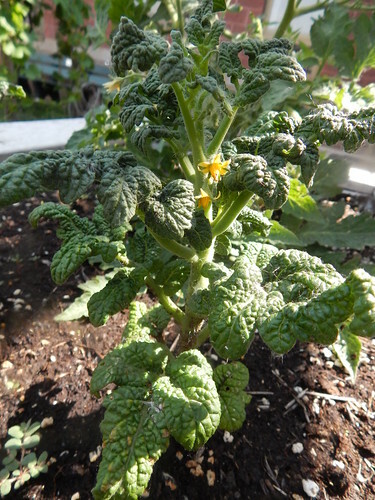 As you can see, this plant (and most of the other tomatoes) are starting to bloom and set fruit. 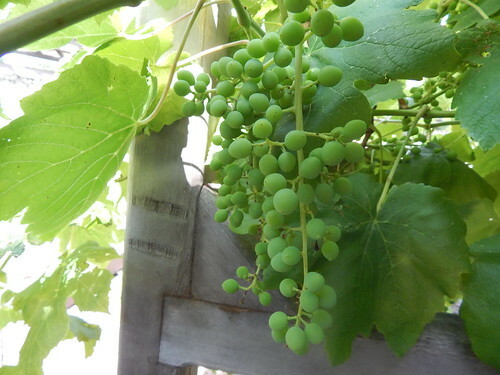 Our ‘Himrod’ grapevine is starting to fill out the fruit. It has quite few bunches this year, despite the vines not being overly large last year. Hopefully we don’t have any major insect or disease issues before harvest. This is the ‘Patio Plum’ toamto plant. It is maybe 8 inches tall, but showing tiny flowers. I keep wanting to think there is something wrong with it, but it seems perfectly healthy. Just super tiny! In 2010, we did an Asian garden and in 2013 we did an Indian (Asia) garden. This year we wanted to reprise the theme while focusing on specifically southeast Asian / Chinese / Japanese vegetables. As you can see, we have yet another garden with lots of different varieties and lots of complexity going on. Many oriental vegetables are cool season, which means they are either planted in the spring or fall (or both), which allows us to try many more varieties in one growing season. 1-5. We have a selection of herbs common in Asian cooking. FYI – Flowering Chinese Leek is just another name for Garlic Chives! 6. ‘Ladyfinger’ Okra is supposed to be smooth and tender even at larger sizes. 7. ‘Round Purple’ Eggplant is just that – a round, purple variety. 8. ‘Choryoku’ Eggplant is a long, narrow green variety. 9. ‘Fushimi’ pepper is a thin-skinned sweet Japanese pepper. 10. Winged bean is a variety that produces pea-like pods but with winged edges. It’s hard to describe, so you’ll just have to wait and see it! 11. ‘Tokita Scarlet’ Carrot is a red carrot variety. 12. ‘Hybrid Fuji’ kohrabi is a large, green variety. 13. ‘Hakurei’ Turnip is a white, salad-type turnip that is good for eating raw. 14. ‘Summer Top’ Cucumber is a burpless, oriental variety that produced 9-10″ long cucumbers and has good disease resistance. 15. 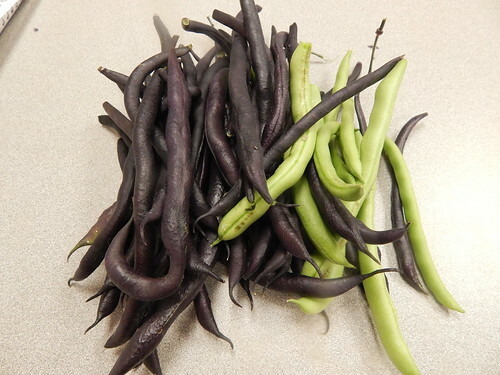 ‘Purple Red Mart’ Long Bean is a long bean that will grow on a trellis and produce 15-18″ beans that are purple in color. We were especially interested in this variety because they are supposed to turn black when cooked. Yum! 16-18. Mizuna and Mustards – the mizuna is purple-veined to purple leaved (not pure seed lot) and the mustards are very finely frilled varieties that are a bit spicy and good for salads. 19. ‘Dok Hybrid’ Luffa is a luffa gourd that can also be eaten like a zucchini at the immature stage. 20. ‘Hybrid Golden Honey’ Melon is a yellow-skinned melon with floral white flesh. 21. ‘Green Lance’ Chinese Broccoli is not a head forming type of broccoli, but rather one that has lots of smaller shoots. While it may seem like there are some strange things in this garden, many of them are similar to other plants we have grown in the past, so I’m pretty confident in their productivity. I will be honest that I’m already plotting what recipes I can try with all these vegetables though! The garden is almost ready to for the winter. We removed the remaining sad tomato plants and the squash and trellises this week. The only “warm season” things left are the pole beans, the flowering sages, and the annual flowers. We don’t have a lot of cool season plants either. Just the lettuce, spinach, Swiss chard, and a few herbs and strawberries. You might notice that we left the straw after removing the plants. I feel like we are constantly trying to balance protecting the soil by leaving the straw on over the winter with reducing insect pressure by removing a place that insects could overwinter (in the straw). 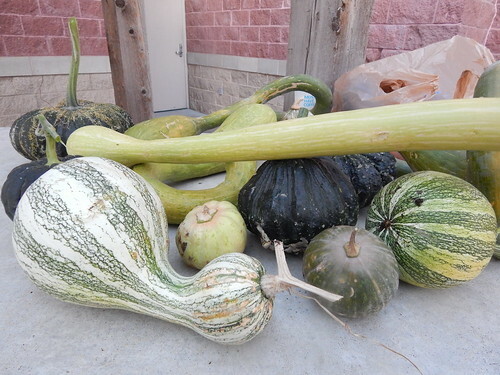 We harvested the remaining squashes as we took down the trellises, but most of them weren’t mature yet. Squash is technically edible at almost any stage, but a winter/hard squash that is not fully hard yet will likely not have very sweet or good flavor. They were still cool looking though! 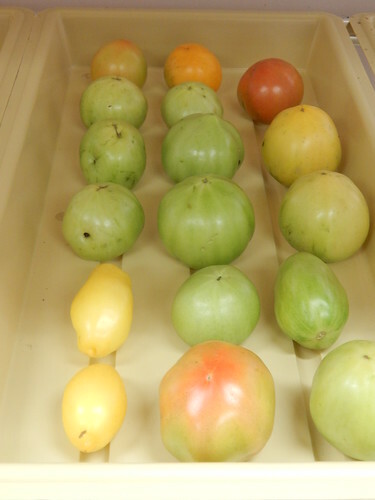 Since we talked about ripening green tomatoes last week, I thought I’d show you a couple before and after pictures. My office gets pretty warm, hence the quick ripening. 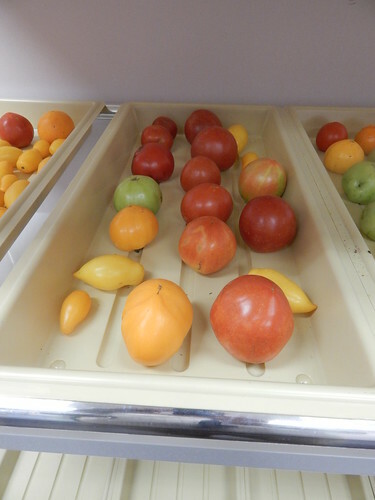 Again, if they were in a cooler spot, they wouldn’t have ripened so quickly. Even the really green tomatoes in this batch have mostly ripened! 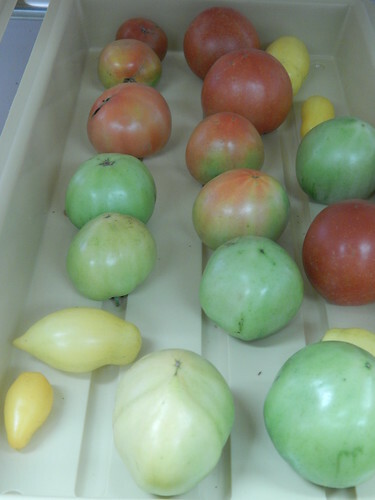 There are still a few holdouts, so the question is if they were truly mature and will ripen eventually or if they weren’t completely mature and thus will not ripen at all. The pole beans are still doing well. The green ones have slowed down some, but the purples are still producing like crazy. The purple variety is ‘Carminat’ and it is probably one of the sweetest snap beans I’ve ever eaten raw. Different bean varieties really do have slightly different flavors, and this particular variety is very sweet. Some varieties are nutty without having any sweetness and other just taste green/like grass. 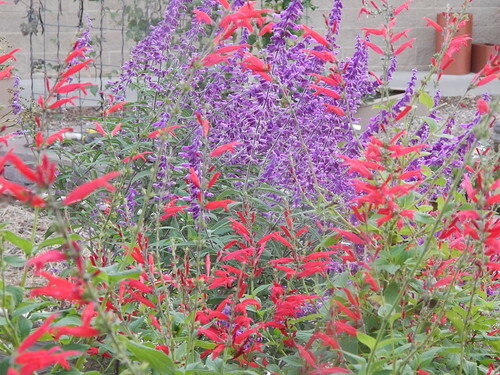 The most photogenic thing left in the garden is clearly the Pineapple Sage (red) and the Mexican Blue Sage (purple). They have pretty much taken over their bed and with the tomatoes gone can really show off now!